There are always unusual grave markers in a cemetery. And Woodland Cemetery in Dayton, Ohio, is no exception. We came across the monument in the picture above and were fascinated by it. There was a brochure next to the marker that told us the story of a little five-year old boy who lived with his parents in the back of his father’s shoe repair shop during the mid 1800’s. 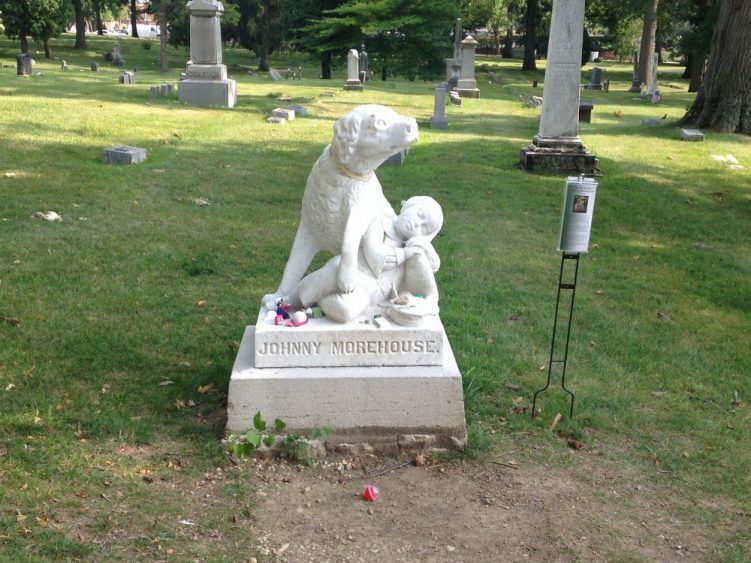 As is often the case, Johnny had a pet dog who played with him and was his constant and loving companion. One day Johnny and his dog were playing by the edge of the Miami & Erie Canal, which was near their home. Johnny accidentally fell into the canal and froze to death quite quickly. His dog did his best to save his master, but was not successful. Johnny’s body was recovered and he was buried in Woodland Cemetery. As the story goes, his dog was discovered several days after the burial sitting on the graveside. The dog continued his vigilance over the grave throughout the days and nights that followed. People who saw the dog there were concerned that he would starve to death and began to bring him food to eat. To this day, visitors to the gravesite often leave small children’s trinkets on the grave in memory of little Johnny. Those items are usually removed when found by the cemetery staff because it was discovered that it was causing the monument to deteriorate. Here is a great story about a dog’s love for his master and his willingness to give up his life to watch over the young boy day and night.